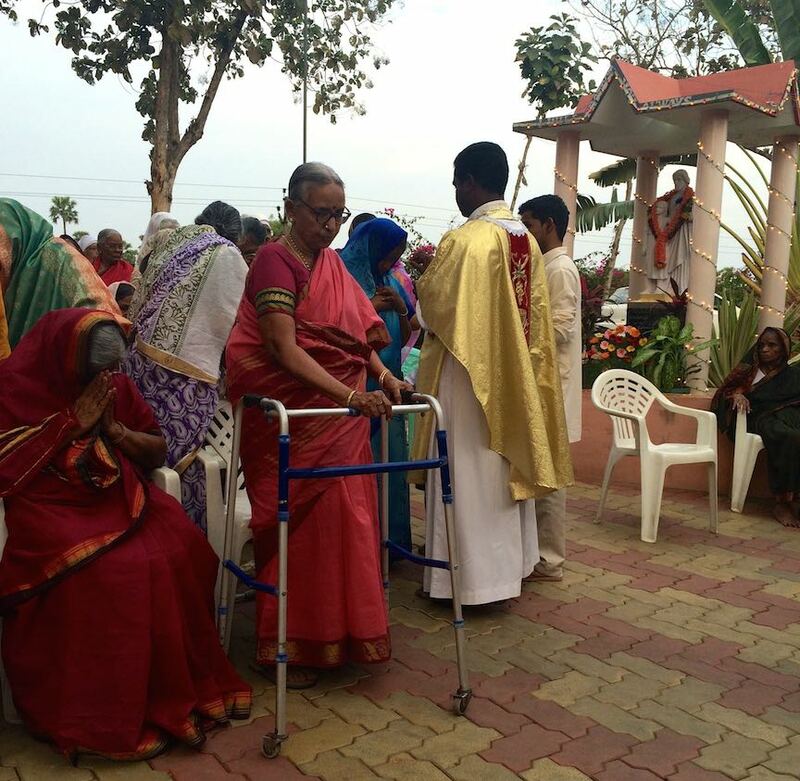 Visiting with seniors in Nambur, India | Walk with us! Yesterday we went to St. Joseph’s Home for Seniors run by the Little Sisters of the Poor. 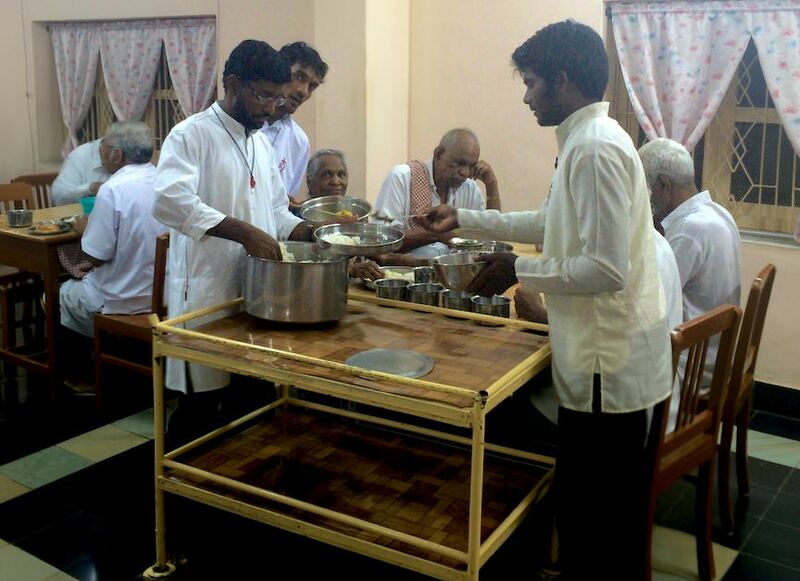 Our priests frequently say Mass here though there are two retired Indian priests living in the home; both are ambulatory and one kind of acts as the daily chaplain to the residents. The vast majority of the 85 +/- residents are Hindu with maybe about 20 to 25 actually being Catholic. Traditionally Hinduism is a very tolerant religion though their now exist a fundamentalist wing that does not look kindly on other faiths. I would say the residents come from the tolerant majority as they attend the Catholic services, pray the rosary in common, etc. This is not the first time I have heard that Hindus like coming to Catholic liturgies and frequently attend major feats such as Christmas and Easter. Our Mass was scheduled to begin at 4:30 pm and because of that the first group left the house at 3:30 pm. Nambur has the same transportation problems as Eluru in that with only one car (van) it can’t possibly carry the entire community at the same time. I opted to wait for the second group as it would mean less downtime waiting for Mass to begin. By the time we arrived and things got sorted out it was about 4:45 pm when Mass began. It was held outdoors just next to the main entrance. Fortunately, the way the building is situated and with the vegetation that surrounds it the temperature was very comfortable. It helped that their was a slight breeze as well. I’ve quipped a couple of times: India would be a very comfortable place to live if it was in the shade all the time. Our own Fr. Sunder, SCJ, was the main celebrant joined by Frs. McQueen, SCJ, Christy, SCJ, and Marianand, SCJ, plus the two retired priests from St. Joseph’s. Fr. Marianand led the choir, which consisted of our novices who speak Telugu. That’s also why Fr. Sunder was the principal celebrant as he is from Andhra Pradesh and Telugu is his native tongue. The Mass took just under an hour as Fr. Sunder kept his homily to around 15 minutes keeping his audience of senior citizens in mind. Obviously I did not understand a word of it, but I too was grateful for its length. I must say though, I’ve gotten use to sitting and thinking to myself for 30 to 40 minutes while the preacher goes on in one of the local languages. After Mass ended the next task was to get all the residents heading inside and towards the dining room. St. Joseph’s is a complete facility and they have a wing for those residents who need full-time care and cannot take care of themselves. We didn’t spend anytime with that group though one of the sisters who works on that wing encouraged Fr. McQueen to include them next year when the novices come for St. Joseph’s Feast Day. Actually, several of our novices told me they come to St. Joseph’s from time to time to put on shows for the residents. The home as a small auditorium with a stage that lends itself well to putting on a performance. I asked Jesu if they do dance routines (he’s one of the better dancers) and he said yes and sometimes they get the residents involved as well. In that case they do what here is called an action dance. Some of you might be familiar with these as ice breakers with youth groups or other such gatherings if not think of the famous chicken dance and you get the idea. Fr. McQueen told me we would eat with the sisters following the residents’ meal. A number of us were sitting out in front shooting the breeze when one of the sisters came to Fr. McQueen to remind him part of this annual event included the novices helping to serve the residents. While Fr. McQueen may have forgotten not all of the novices did for when I tagged along with the slackers we found four or five of the novices already hard at work (two more were in the scullery helping with dishes). The dining room serves both men and women though it seemed to me most tables were either all men or all women but I was not really paying too much attention to that. Of course rice was an important component of the meal. The favored drink was buttermilk which, according to Indians, helps cool you down. It will be a standard drink until the rains come. 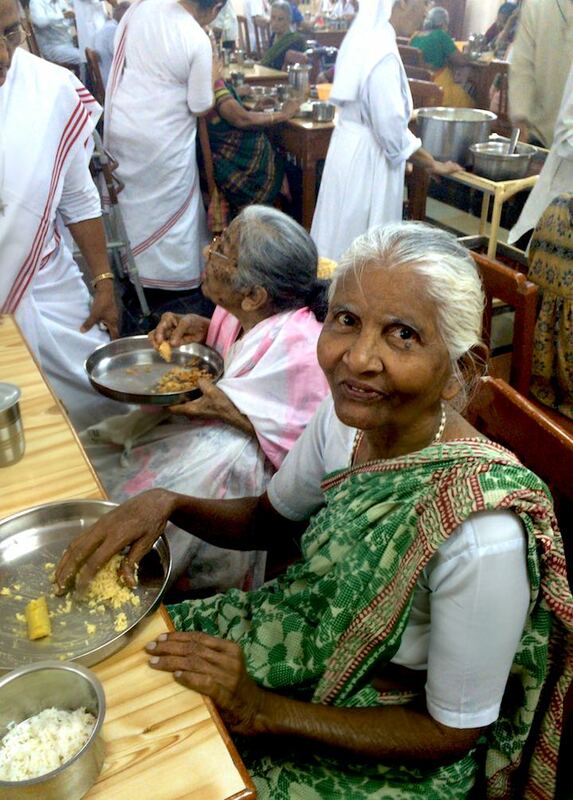 Once the residents finished their meal and were off and about their merry way we all gathered back out in front by the main entrance to enjoy our own evening meal with the Little Sisters. They put on a pretty good feed for us including a cake, fruit cocktail and topped off with ice cream. If anyone starved it was their own fault. Conversations ebbed and flowed in one director or another but one question kept popping up from group to group: I wonder who won the cricket match? — Happy to report India by 109 runs! cream. If anyone starved it was their own fault. Conversations ebbed and flowed in one director or another but one question kept popping up from group to group: I wonder who won the cricket match? — Happy to report India by 109 runs!